In south Linn County, this admonition spans Interstate 5. Does it count as distracted driving if you lift your eyes from the highway to read the overhead sign with an implied warning against distracted driving? Or how about driving through a long work zone on I-5 while snapping photos to illustrate a story about ODOT’s latest safety campaign? ODOT says that in 2014, the latest year for which it has complete data, there were nearly 500 crashes in Oregon highway work zones. And this despite the multitude of warnings and signs and orange cones and barrels that mark construction sites on our public roads. A cynic might say there would be fewer crashes if there were fewer construction zones. But that would be wrong. They don’t fix the highways for fun. In most cases they fix the roads because they need fixing. And they need fixing because with all our driving back and forth, we have worn them down. This month, ODOT hopes to call public attention to bad driving in construction zones. More to the point, it wants us to drive better and more safely. To that end, it arranged to have two bridges bathed in orange light during the first two weeks in May. The bridges are the Morrison in Portland and a railroad bridge in Salem. Why those two? Because, ODOT’s David H. Thompson explained to me, these two happen to have flood lights as well as managers willing to deploy orange filters to call attention to the current safety campaign. “I wish there were more lighted bridges in other Oregon cities,” Thompson said in an email. I don’t know how many motorists are going to improve their driving because they happen to see a bridge bathed in an orange glow this month. Along with ODOT, I hope lots of them. 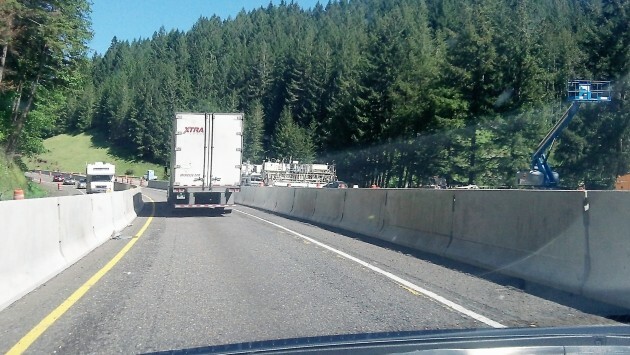 Concrete barrier separates traffic from freeway reconstruction south of Cottage Grove. One place I’d like to see orange (seems more like red-orange) removed: the “slow” signs used by flaggers. It also doesn’t help that “slow” and “stop” look similar. Even the shapes aren’t distinct enough. “Stop” doesn’t look bad from a distance, but “slow” is very muddy and uncertain looking to my less-than-perfect, but still legal eyes.